I love traveling, but of course one of the biggest downsides is missing great events back home while you’re gone. The 3rd Eat My Blog Bake Sale is one of those occasions! Not only is there an epic array of goodies to take home – brought to you by the most talented baking bloggers in town – but you benefit a great cause in the process. All proceeds go to L.A. Regional Food Bank! You don’t have to take my word for it. Check out this terrific menu, with the gluten-free and vegan items denoted for your dietary convenience. Got a feline or canine friend? They get to enjoy some treats, too! And remember, even though the event goes until 4 PM, personal experience says to get there as early as you can for the best selection. 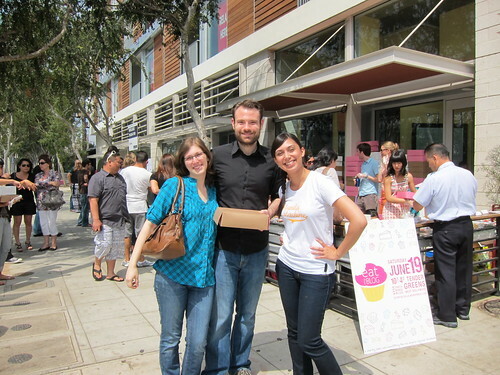 Bloggers will be standing by to fill your customized boxes with your hand-picked, hand-baked goodies at Tender Greens. This entry was posted in charity, Events, Food, West Hollywood and tagged bake sale, charity, Eat My Blog, L.A., LA Regional Food Bank, los angeles, Tender Greens, West Hollywood. Bookmark the permalink.